The Atomic Age is a difficult period to memorialize. Research from the time period yielded a clean form of energy, but also killed hundreds of thousands of individuals in World War II and plunged the planet into a Cold War. The National Atomic Testing Museum in Las Vegas, Nevada aims to collect artifacts and interpret the research that occurred at the Nevada Testing Site, home to 928 nuclear explosions over six decades. The Atomic Testing Museum recently became a "national" museum when President Obama added the museum to those affiliated with the Smithsonian Institution in early 2012. There is only one other national museum dedicated to nuclear research in the United States, the National Museum of Nuclear Science & History in Albuquerque, New Mexico. The museum is an outgrowth of the Nevada Test Site Historical Foundation, a group formed in 1998 to commemorate and interpret the history of nuclear weapons research conducted at the Nevada Test Site. 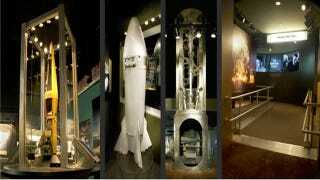 The group raised sufficient funds to open the Atomic Testing Museum in 2005. Exhibits at the National Atomic Testing Museum include a nuclear bomb simulation chamber, hundreds of examples of radiation monitoring equipment, and glimpses into Vegas-area lifestyle during the period of above (and under) ground nuclear experimentation at the Nevada Testing Site. Memorializing nuclear weapons creation and use has been a problem for the United States in the past. Controversy surrounded a 1993 attempt to display the Enola Gay, the plane that flew the atomic bomb dropped by the United States on the city of Hiroshima, at the Smithsonian Air and Space Museum. Individuals on both sides of the issue disagreed on the wording and interpretation of the exhibit, leading 81 members of Congress to ask the Director of the Air & Space Museum, Martin Harwit, to resign in 1995. The Enola Gay is now on exhibit at the Air and Space Museum's Steven F. Udvar-Hazy Center, 30 miles away from the National Mall and the Smithsonian Air and Space Museum. The National Atomic Testing Museum in Las Vegas recently opened an exhibit detailing research at one of the world's most mysterious places, Area 51. The exhibit centers on "authentic" military technology created at Area 51, like the U-2 spy plane. The exhibit also features UFO-related artifacts, including a sphere recovered in 1986 from Height 611 in Russia. A previous temporary exhibit centered on "Trench Art" — art created by soldiers during long periods of downtime between skirmishes in World War I. These intricately crafted souvenirs created for loved ones back home consists of engraved grenades and bullets along with mortar shells transformed into ash trays. The museum is actively looking for personal narratives from those with experiences from Atomic Testing or work during the Cold War and routinely holds lectures conducted by nuclear weapons specialists and UFO enthusiasts. If you cannot travel to Nevada, a podcast tour of the museum is available for download to tease your ears and imagination. The top image is courtesy of the National Atomic Testing Museum. Additional images also courtesy of the National Atomic Testing Museum. Sources linked within the article.